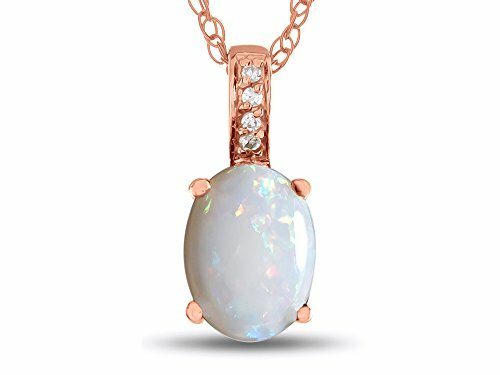 The stunning LALI Classics 14k Rose Gold Opal Oval Pendant Necklace, crafted in 14 kt Rose Gold . This attractive design is set with 1 stone 0.830 carats prong set white iridescent Oval Opal eye clean clarity, 4 stones 0.020 carats total weight, prong set Round White Diamonds L-M color I3 clarity. This product measures 4.00 mm high, 4.00 mm wide and 10.00 mm long.18 inches gold chain includedWarranty: - This item is covered by our exclusive Silver Shield Lifetime Warranty. This exclusive lifetime coverage is offered ONLY by Finejewelers so please shop with confidence, our quality is guaranteed for life! If you have any questions about this product by Lali Classics, contact us by completing and submitting the form below. If you are looking for a specif part number, please include it with your message. Wellingsale 14k Yellow Gold Polished Religious Miraculous Mary Medal Charm Pendant with 1.2mm Classic Cable Chain Necklace - 18"
Solitaire Diamond Cross Pendant Necklace in 14k Yellow Gold 16"
14k Yellow Gold Lifeline Pulse Heartbeat Charm Open Heart Pendant Necklace, 22"
10k White Gold Amethyst and Diamond Accent Flame Pendant Necklace, 18"
Ioka Jewelry - 14K Tri Color Gold Diamond Cut Our Lady of Guadalupe Stamp Religious Charm Pendant with 1.5mm Valentino Chain Necklace - 22"
14k Yellow Gold Leaf Pendant Necklace, 18"
14k Rose Gold Solitaire Diamond Cross Delicate Pendant Necklace (Extra Small), 16"